My slogan slates include one liners taken from different areas of life. You will find everything from Peaky Blinders through to random thoughts. If you have ideas for your own quotation slate, then send me a message. You can see my quotation slates as either statements or as an aspiration for your future. 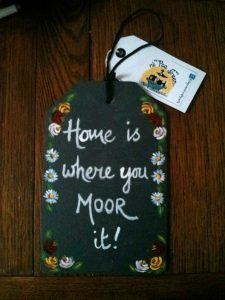 For instance, my very popular quotation slate ‘Home is where you moor it!’ was recently bought as a gift and was one couple’s first step towards narrowboat ownership. 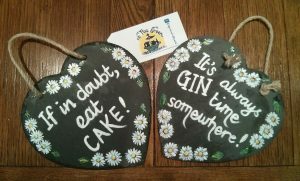 Another popular quotation slate ‘It’s always gin time somewhere’ has given some the legitimacy to enjoying a little gin at lunch time. 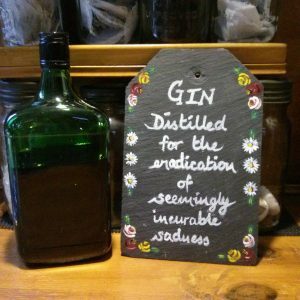 My latest addition, maybe seen as somewhat l darker, the line from Peaky Blinders, and muttered by Thomas Shelby, ‘gin distilled for the eradication of seemingly incurable sadness’. 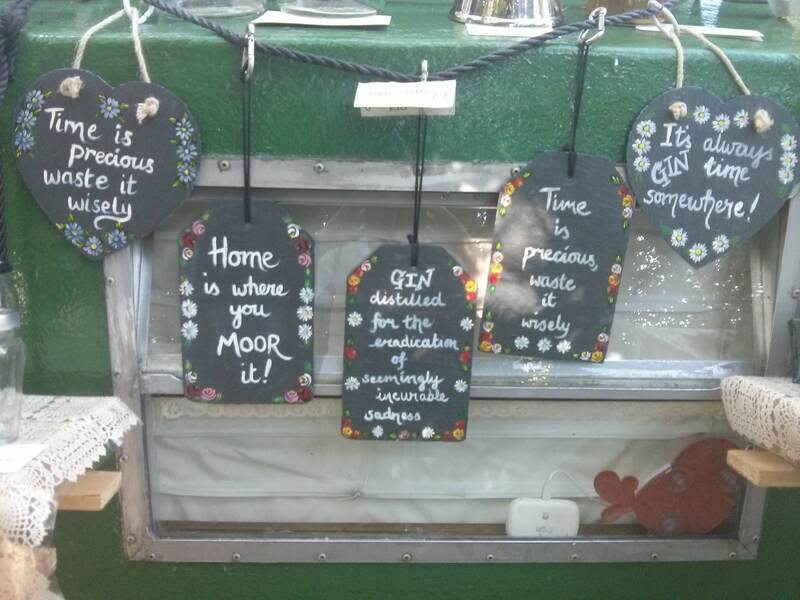 For fans of the show it will probably raise a wry smile and give another reason for a gin. I am a keen advocate of ‘If in doubt, eat cake!’ I feel as a society we don’t engage with this enough! 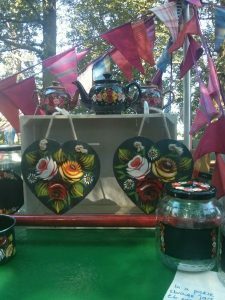 All quotation slates are decorated with daisies and roses, wording is completed with either a chalk pen or painted on. If you plan to hang your slate outside please let me know, I will weatherproof with varnish before posting. I usually have two shapes in stock, hearts and rectangles. Prices are £12 including postage. 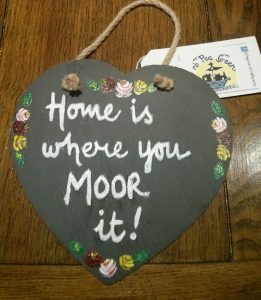 I have recently added to my slate collection with some lovely rose decorated slate hearts. These are also £12 including postage. Smaller slate hearts are £10 including postage. To order simply contact me via email, Facebook, Instagram or Twitter. I usually respond within a couple of hours. When it comes to paying I accept PayPal or can message you my bank details for BACS.